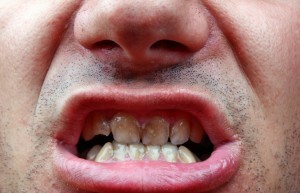 Do you have brown or white spots on your teeth? Has this discoloration been part of your smile your whole life? You may have fluorosis, a discoloration of teeth during dental develop. Before permanent teeth ever erupt from the gums, they absorb fluoride and other nutrients in order to build strong, healthy dental structures. Most teeth are fully formed by the time a patient reaches the age of 8. If kids are over exposed to fluoride before teeth have fully developed, discoloration on the surface of teeth, fluorosis, occurs as a result. At Premier Family Dental, we offer multiple treatment options to reverse fluorosis discoloration. Fluorosis is caused by the over exposure of developing teeth to fluoride. Fluoridated water is enough to cause this dental discoloration in some patients while ingesting excess fluoride toothpaste or mouth rinses or taking fluoride supplements causes fluorosis for others. Whatever the cause, it’s essential to understand that this discoloration only happens while teeth are developing. Once permanent teeth have formed and erupted, fluorosis does not occur. For this reason, it’s essential that parents monitor their child’s toothpaste and mouth wash usage, and consult with a physician and dentist before administering fluoride supplements. Teeth whitening – for patients who have brighter white spots on teeth as a result of fluorosis, bleaching teeth may make these white spots less noticeable. Cosmetic bonding – similar to composite resin filling material used to repair decayed teeth, cosmetic bonding is directly applied to the surface of teeth to conceal stains caused by fluorosis. Porcelain veneers – thin sheaths of egg shell-like porcelain are fitted over the front of teeth to hide staining and discoloration, and veneers are stain resistant which makes them a great long-term option. Abrasion and special toothpaste – in some cases, patients may consider a series of abrasion treatments to remove a microscopic amount of dental structure coupled with specialized tooth pastes that rebuild tooth enamel. Over time, the repeated removal and rebuilding of enamel leaves patients with beautiful, natural smiles. If you or a loved one have experienced dental staining and discoloration as a result of fluorosis, contact the team at Premier Family Dental today. We offer a variety of restorative and cosmetic treatment options to help you get the pearly white smile you deserve.